Problem: The reality is that energy drinks and coffee have become almost as associated with motherhood as nails and tools are with a job site. For most moms, our job demands require an early rise. This often comes with an over reliance on coffee, energy drinks, energy shots and anything stimulant based, which can lead to adrenal health issues. Plus, energy drinks often contain excess sugar and chemicals, while coffee is very acidic. Both aren’t particularly friendly on the pocket book, either. 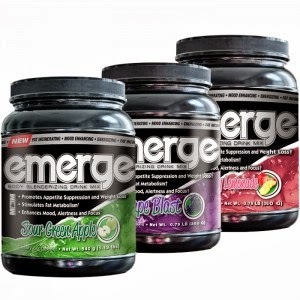 Emerge is a fantastic weight-loss beverage that duals as a pre-workout energizer. What people don’t realize is that this product kills three birds with one stone! Go ahead and use Emerge up to twice a day in place of energy drinks, coffee, etc. You’ll never go back! It enhances mood, elevates metabolism and helps curb your appetite all while tasting fabulous in 12 different flavors! “Max Muscle’s Emerge is my favorite component in my fitness and nutrition regimen. Since I started drinking Emerge 7 months ago, it (along with careful attention to my nutritional needs, high intensity workouts and weightlifting) has helped me shed 30 lbs and dramatically decrease my body fat percentage. Emerge gives me the energy I need to fuel my active lifestyle as a mom as well as my workouts. It helps give me energy and focus and helps with mood balance as well! What mom doesn’t need that? Emerge has completely replaced my daily Starbucks fix, I no longer drink coffee at all! I have almost no sugar cravings because of Emerge, and the fiber helps keep me full and prevents that mind-less mom-snacking. Emerge is THE one thing I would recommend to a busy mom looking to increase her endurance both in the gym and at home! Emerge retails at $55, but you can win your own (in flavor of your choice) by entering our giveaway!! Ends Tuesday, October 22. As always, this giveaway isn’t affiliated with iTunes, Apple, any cell phone provider of any kind, Facebook, Twitter, Google Play, etc. By entering you agree to our rules. Prize is provided by Max Muscle Manassas, consult your physician before making any changes to your lifestyle. View our full rules here.